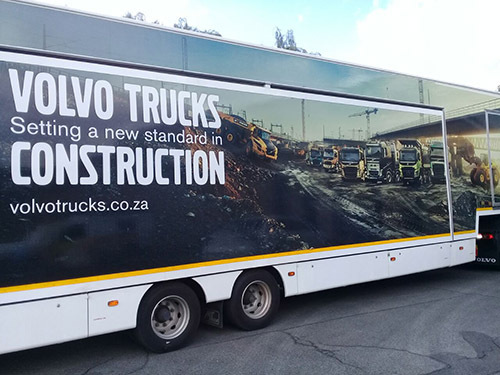 Big Brand Productions recently branded some of the features for the Volvo Construction event in helping them to set a new standard in construction. For a high quality and impact event, one needs branding to fit the profile. There were various signage and branding that Big Brand Productions printed and installed for this big Volvo event in 2017. Among the installations was wall branding against the sides, back, as well as the entrance was beautifully set up. The print and the setup were done perfectly inside and outside of the truck. The team also had to print vinyl for the truck trailer, as well as for the truck itself. See below a slideshow of photos. The sides of the trailer, the rear doors, as well as the truck’s door were wrapped in cast vinyl. The trailer is more than 14m in length and 2 m in height. On the inside of facilities a long wall was branded with Volvo’s 6 construction trucks. 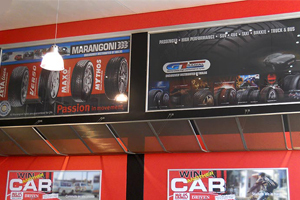 3 Wall mounted fabric frames were installed next to the entrances of the facility showing off not only beautiful trucks but amazing quality in print and installation work to capture attention. Outside on the grounds multiple boards with maps were also installed as well as pylons of 1m x 1.8m were used. Big Brand Productions rent out these pylons, simply changing the design and style of the artwork you require. This is perfect for almost any event; it’s sturdy and grabs attention. For more information regarding these pylons or any other marketing needs, contact Big Brand Productions. If you need to set a new standard in your marketing material, contact Big Brand Productions for quick and quality assistance.